So it finally arrived and time for the review. I bought the Glock 17L from Octagon Airsoft for $115 plus $56 shipping and then Royal Mail and customs stung me for 30 quid so all in this cost about £160. Let's hope it's worth the money. I remember Bell from years ago when they used to make substandard AEG's using plastic V3 gearboxes with the AEG being made of plastic and poor quality metal parts. They used to directly copy TM weapons and didn't really have a very good reputation so fast forward to today and they have reappeared back on the airsoft market with a load of Glock variants for sale. Check out airsoftglobal or any of the other asian websites to see the different types for sale. 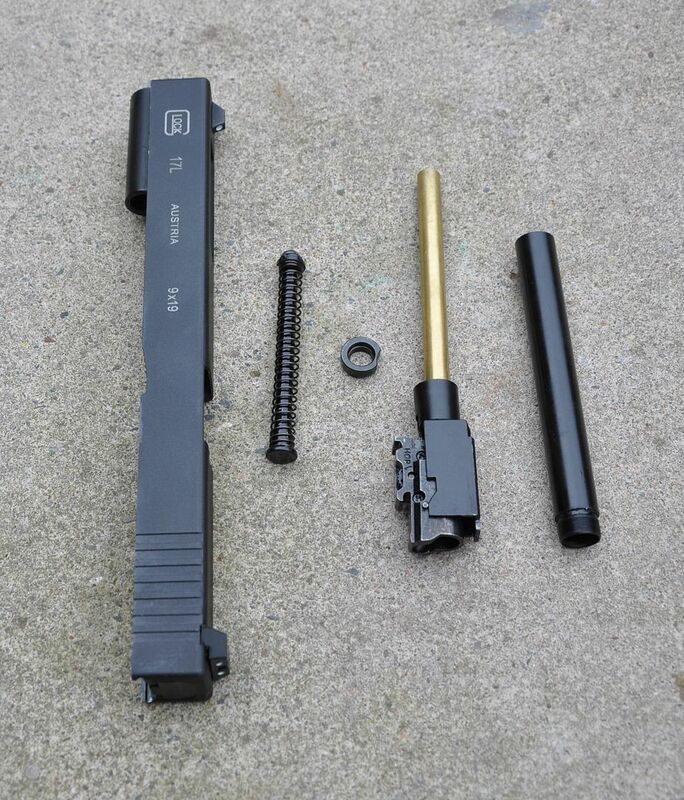 I ordered the Glock 17L from http://www.octagonairsoft.com and I've used them a couple of times and I like these guys as they are making some good interesting airsoft parts. 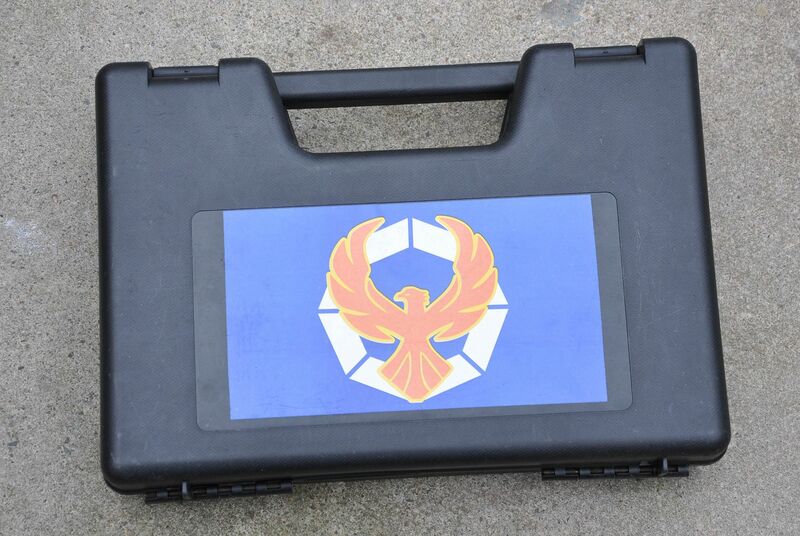 The Glock comes in a plastic case and the one from Octagon comes with an Octagon sticker on the outside. Opening the box you will find the Pistol, Magazine, a cleaning rod and in my case a couple of free patches. There isn't any instructions/paperwork but then again who actually reads these? 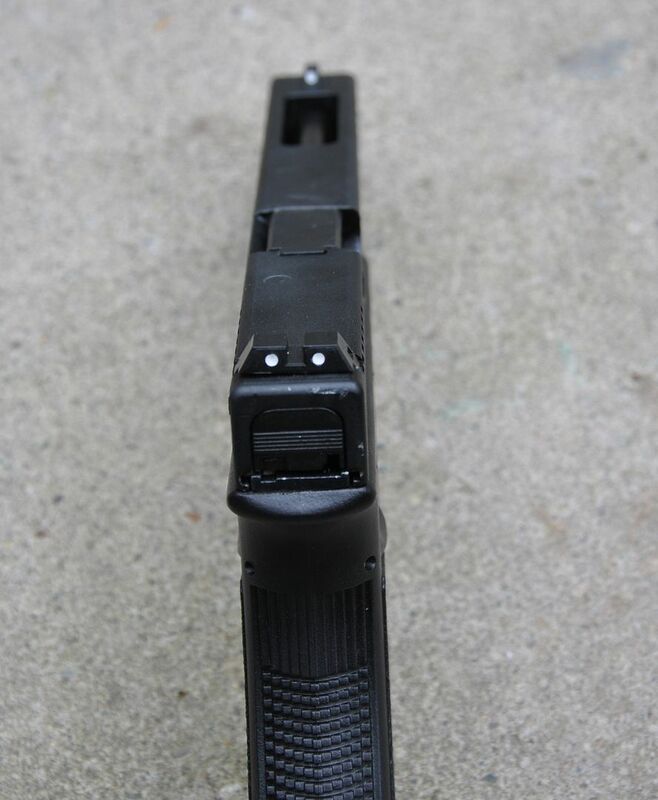 The pistol has a metal slide and plastic lower frame. 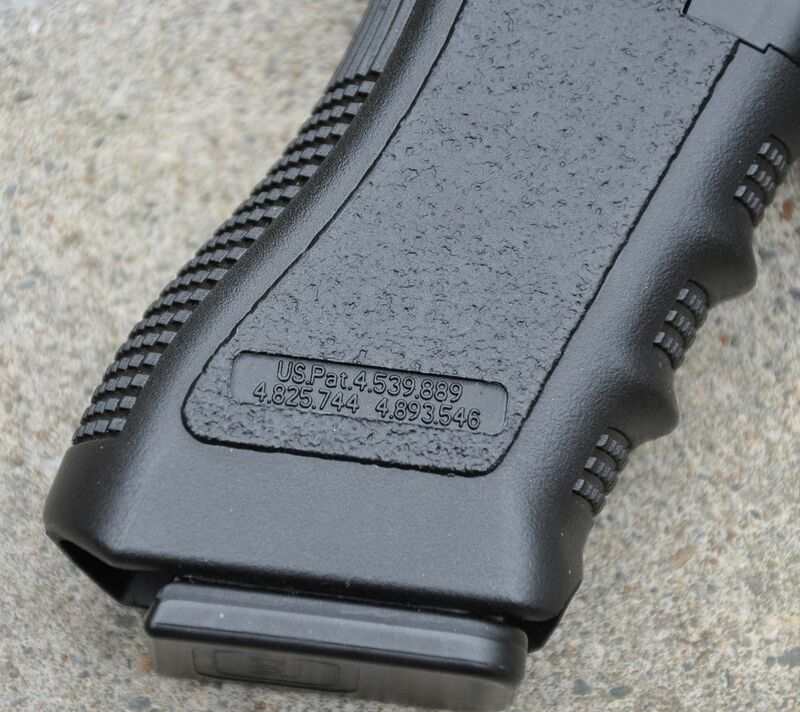 The markings are laser engraved on the slide and look pretty good. The only accurate marking missing is the trades on the frame on the right hand side which can be seen in the pictures below. The metal slide has a nice paint finish, the engraving looks good and overall looks pretty good apart from one issue but more on that later. The sights are the 3 white dot type. The end of the outer barrel is threaded for a silencer adapter. 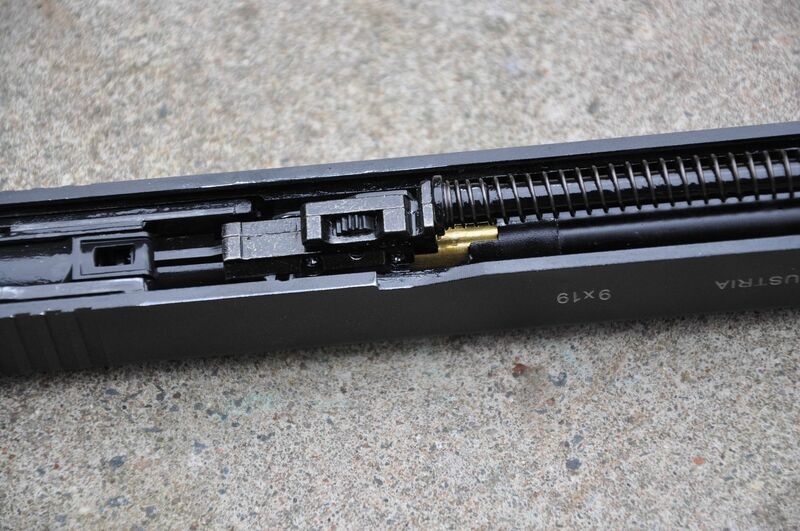 Splitting the Glock down you will see that everything looks to be TM compatible. The Hop unit looks well made and as you can see everything is lubricated nicely. The BBU looks good and again well lubricated. 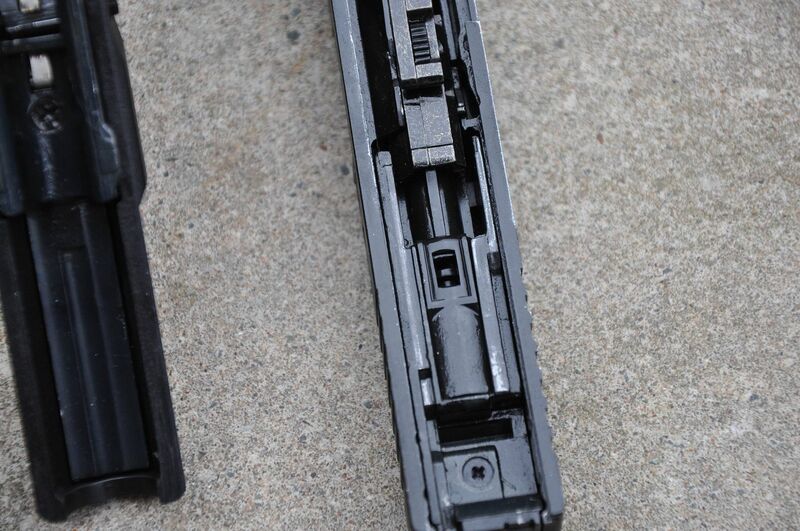 Splitting the top slide reveals that the outer barrel is two part and doesn't have any markings. 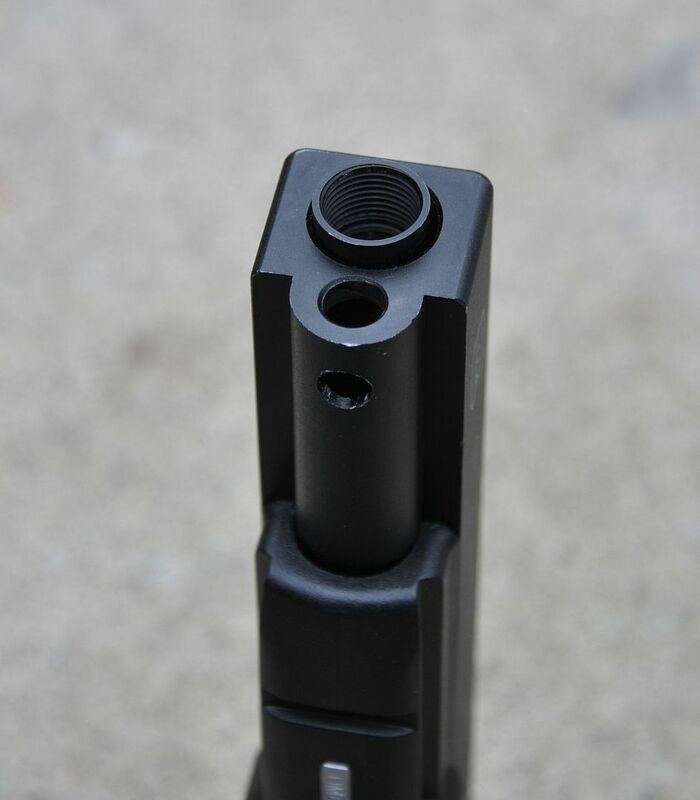 If you want trades on your Glock 17L then guarder make a split outer barrel which will probably fit. I will measure the long inner barrel at some point to see what size is needed to replace it with a tightbore although I might not do this and it will push the FPS over most sight limits but more on this a bit later. 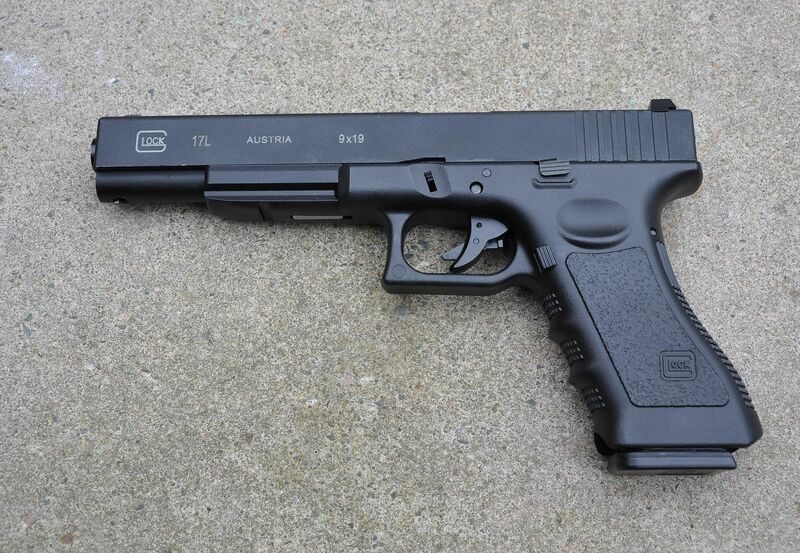 Want to see how long the Glock 17L is? 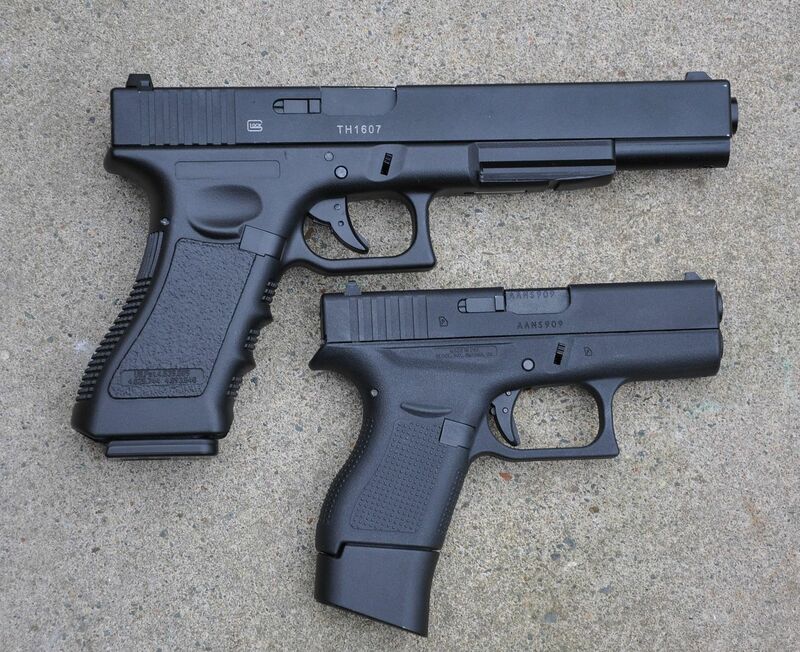 Below is a Glock 17L below a Glock 34 which is below a Glock 17. As you can see it's pretty long. 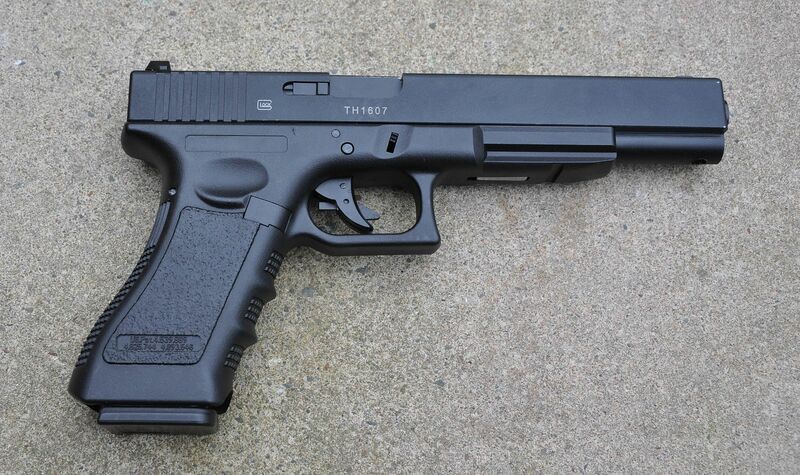 Ok so that's a brief look at the pistol and now I'll go into a bit of detail, good and bad, on the Glock 17L. 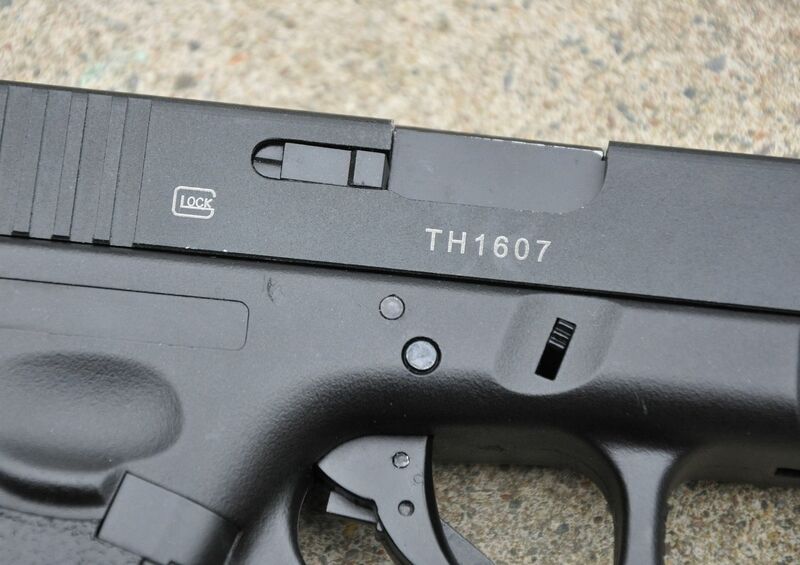 The pistol is a direct copy of the TM glocks but differs slightly because of the long inner and outer barrel. TM/WE/STARK/ARMY magazines all fit fine and work well in this pistol. Everyone of them fires all the 24 bb's without a problem and locks back when empty. When I put it through the chrono I found a pleasant surprise in that it fires around 315 FPS with the supplied magazine and the TM/Stark and ARMY magazines. Remember above I mentioned not putting a tightbore in this? 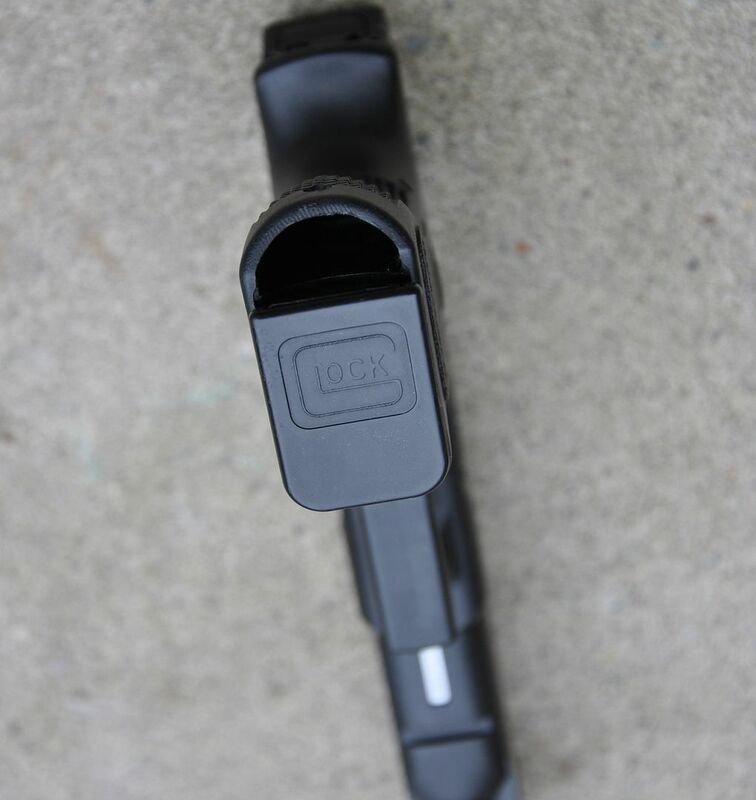 Well I've found that using WE magazines in any Glock usually see's an increase of around 10 FPS in any Glock model and the Bell is no different. In fact it chrono'd at 340 FPS using the WE magazine so if I added a tightbore to this then it would most likely be over 350 FPS which would be too hot for most sites. If I decide to add a tightbore then I could only use it with Bell/TM/Stark or ARMY magazines and even then it's probably going to be firing 340ish. The reason for the standard 315 FPs is simply due to the long inner barrel. 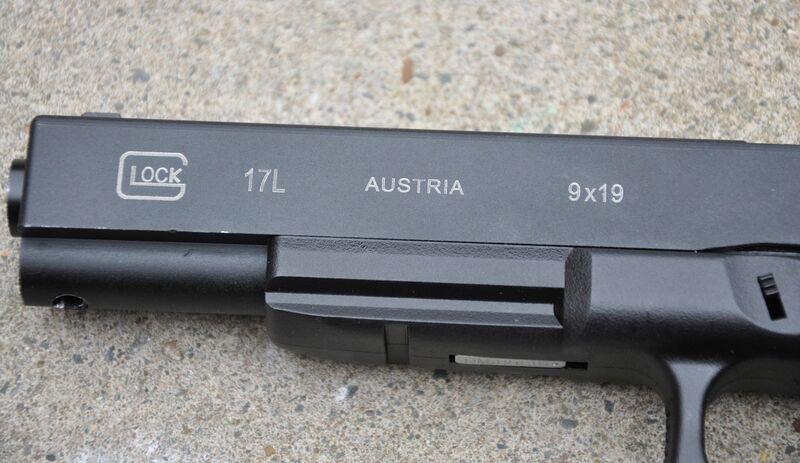 Range and accuracy are both improved over a standard Glock 17 beacuse of this longer inner barrel. I'm putting BB's on target at 55 to 60 meters. The hop unit seems good quality and if it was a bit sub par I wouldn't be seeing the good range or accuracy. The other issue I had with this pistol is a cosmetic one that i found but might not be a problem on other people who buy this. I found some marks on the top of the slide and they look like filled in screw holes. I'm not sure why they are there but they are a bit annoying. They don't affect the performance in any way and I can probably clean them up. 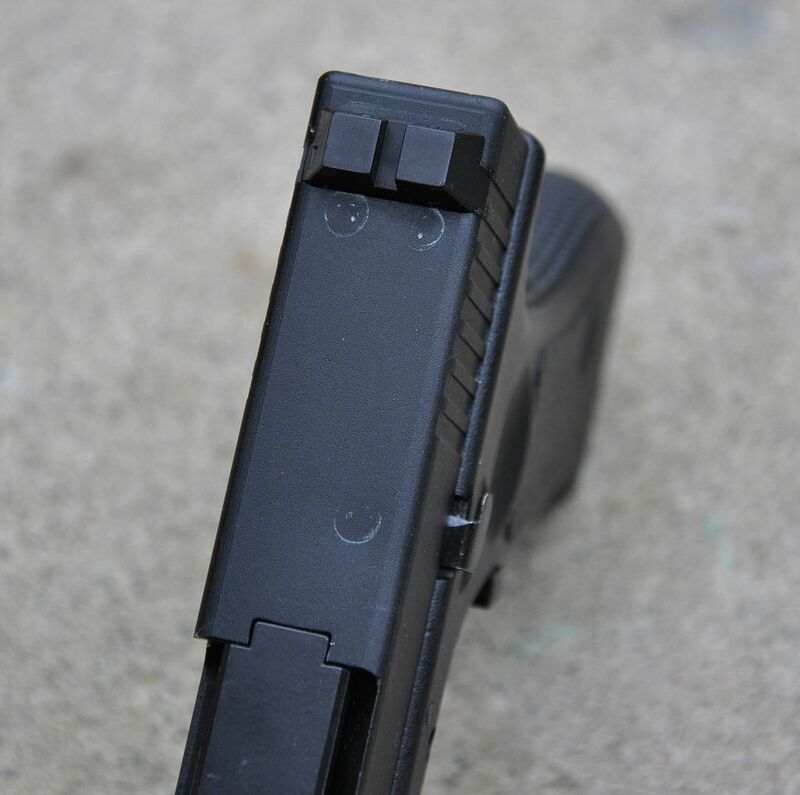 I also forgot to mention that the magazine base comes with Glock trades. 9 out of 10 and it would have got 10 out of 10 if the lower was completely traded and I didn't have some annoying marks on the top slide. The reason for the high score is simply this. It shoots really really well. I can't state this enough, this thing is awesome to shoot. If you have a glock pistol handy try this. Rack the slide back slowly. After about an inch you will feel some resistance and once you pull a bit harder the slide racks all the way back. On the 17L when you rack the slide back it's completely smooth all the way and feels really high quality. Well done to Bell for making a really good Glock. 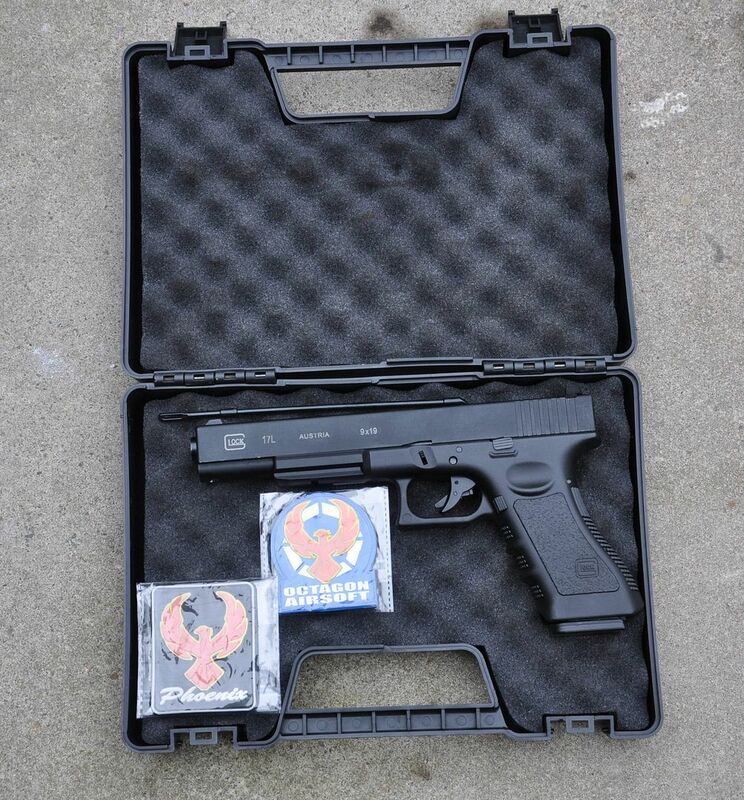 If you are in the market for a Glock then I'd highly recommend this model. It shoots far, accurately and smoothly. ............I was going to end the review there but I thought I'd mention a couple of other things. The 2 piece outer barrel was loose on mine so if you get one make sure you tighten it up before firing or you could end up firing the front part of the barrel across the room! The other thing is the outer barrel rattles a bit inside the frame. Think meat inside a sausage roll and you will get my drift. I think this can be improved with an O ring. It doesn't affect the shooting of the pistol but is just a little bit annoying. I'm still giving it 9 out of 10 even with these little niggles because it shoots so well. 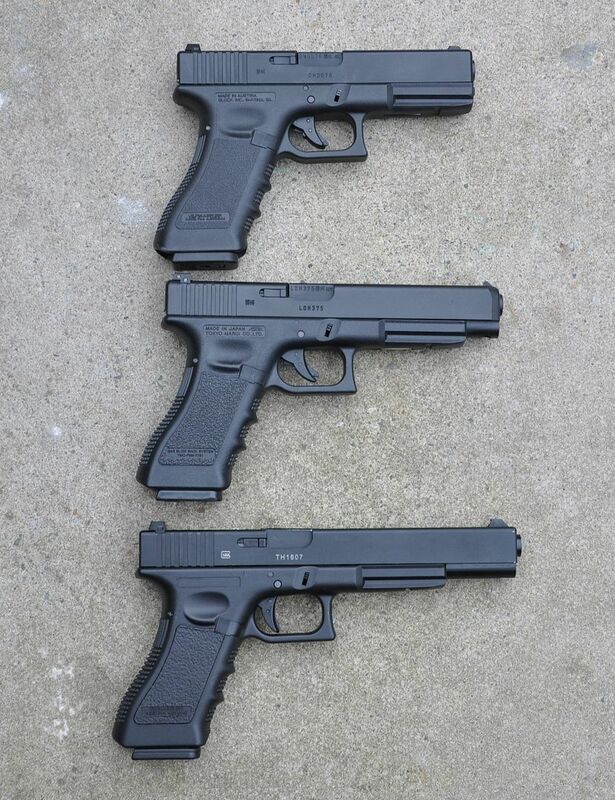 Nice some one finally did a 17L again, shame they used the same old Gen 3 Lower instead of making a correct Gen 2 Lower. 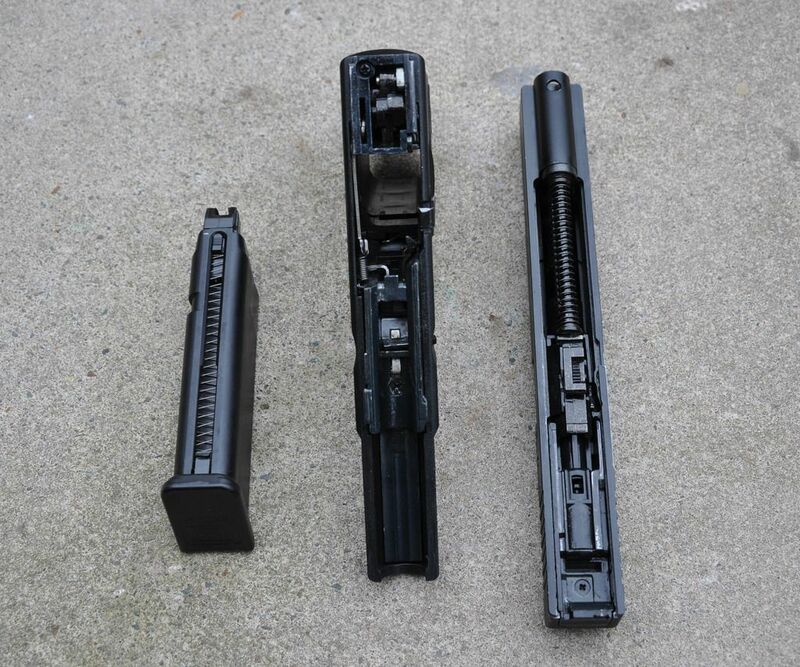 yeah it would be nice if Guarder made a Gen 2 frame for the 17 series and I remember the MGC G17L with the gen 2 frame and adjustable rear sight. sadly I never owned one. 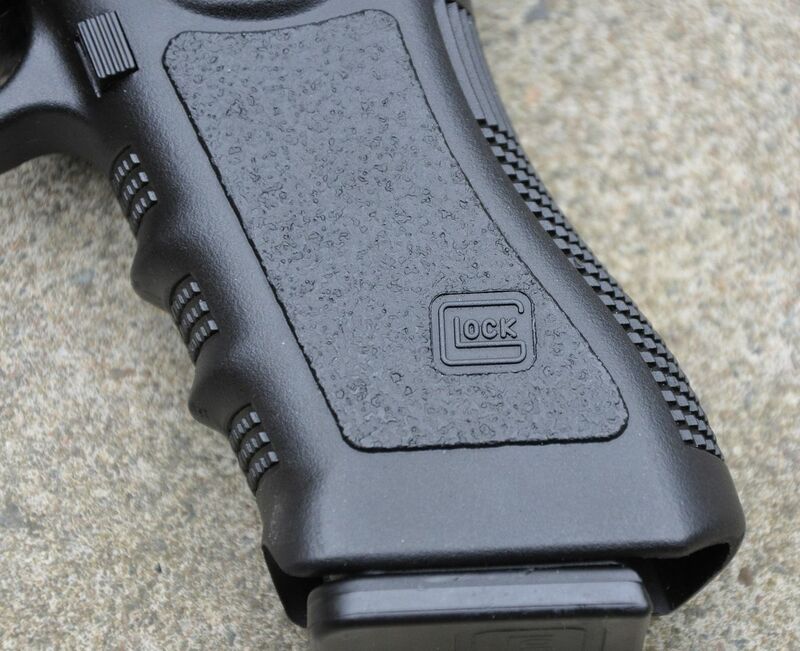 The 17L from Glock comes with the Gen3 frame now and I wouldn't be surprised if they offered one with a GEN4 frame.